I have been playing fiddle-style harmonica for 35 years or so and am interested in sharing information with other players with similar interests. I am a member of the International Bluegrass Music Association (IBMA), the Central Texas Bluegrass Association (CTBA), the Bay Area Bluegrass Association (BABA), Austin Friends of Traditional Music, the Austin Chapter of the Harmonica Organization of Texas (HOOT), and the Society for the Preservation and Advancement of the Harmonica (SPAH). I am one of the songwriters of American Heritage, and I currently play for RedEye, Manchaca AllStars, the Blazing Bows, and K. R. Wood. I also occasionally play for anyone else who desires my harmonica talents, my vocal harmony talents, or my talents with the upright bass, mandolin, or guitar. The Cedar Landing has booked the Manchaca All Stars for a Sept. 20th, 2008, show. The show is free and the food is worth more than the price. If you are in the area, please come and have fun! Take a rest from the mess left by Hurricane Ike. The Old Settlers Music Festival (Salt Lick Pavillion, Austin, Tx. ), is done for 2008. None of us can wait until next year's festival (April 2009)! For the last 9 years I have given a harmonica workshop at this festival that has been very well received (often focusing on bluegrass harmonica or working with one of the festival performers). 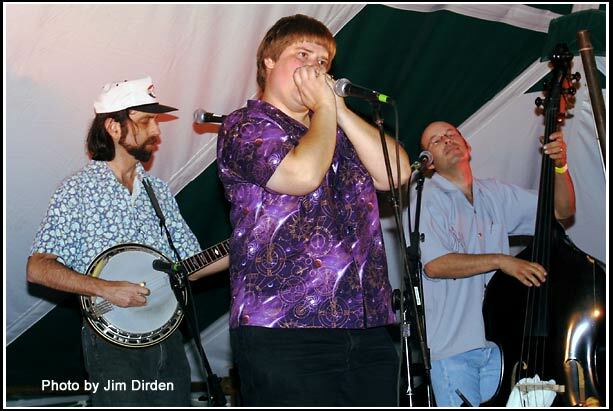 This year Lonnie Joe Howell (a Nashville session musician), Jimi Lee, and Dale Spalding joined me for the workshop, sharing their points of view of the harmonica from the world of country blues, blues, and a touch of jazz. Later on, when a hole developed in the workshop stage schedule, Lonnie Joe and I put on a second workshop for those who had missed the first workshop because of the workshop stage schedule snafu. Both workshops were worth seeing and were well enjoyed. If you are interested in learning about playing the harmonica, then put next year's festival, and this workshop, on your schedule. The Hill Country Acoustic Music Camp's (Schreiner University, Kerrville, Tx.) teaches banjo, mandolin, guitar, fiddle, bass, mountain dulcimer, hammered dulcimer, and voice (and occasionally other requested instruments, such as harmonica) -- all taught by consumate pros with many years of experience. The learning atmosphere is relaxed and conducive to learning, practice, and experimentation. The camp itself is economical: around $525 for instruction, room, and board for 5 days. (Alternate room and board arrangements are available.) [I can tell you from experience that their rooms are very comfortable!] Check www.hcamp.org for more information on the camp, its instructors, and accommodations. The Society for the Preservation and Advancement of the Harmonica (SPAH)convention in St. Louis, Mo., was a blast. The bluegrass "teach-in" table and bluegrass jam sessions went well, as did everything else. Everywhere you went someone was showing or helping others learn about the possibilies on harmonica! The "Teach-In": A multi-day opportunity at the convention to study one on one with someone who knows a great deal more than you on a particular aspect of playing or working with equipment. The "Teach-In" teachers are all accomplished and have certain skills and knowledge that they would love to pass on to anyone who is interested. Thank you Joe Filisko for making such a thing possible. Check the SPAH website for more info on the next harmonica convention in Sacremento, Ca., and on the organization itself. Hope to see you there!! Laurence Baer has written and produced a wonderful debut CD of his original material and has engaged many stellar musicians, including me, to help out on the tracks. Visit CD Baby and check his stuff out. "Storm Ahead" has my harmonica paired together and pitted against a fiddler. If you were wondering how something like that can come out, check out "Storm Ahead". If you love blues and are in the Austin area (Tx. ), then the Austin Blues Society is for you! The Society is off to a flying start, but it needs the help of Austin blues fans. (Watch for joint events between the Austin Blues Society and the Austin chapter of HOOT.) For more information, check out their site at http://www.austinbluessociety.org/. They will be glad to talk to you. If you love blues and are in the San Antonio area (Tx. ), then the San Antonio Blues Society is for you! The Society is off to a flying start, but it needs the help of San Antonio blues fans. For more information, check out their site at http://www.sanantonioblues.com/. They will be glad to talk to you. Camp Bluegrass & Swing Camp will be gearing up for 2009 soon!! Camp Bluegrass & Swing Camp will be gearing up for 2009 soon. It is held on the South Plains College campus, 1401 College Ave. Levelland, Texas 79336. Check www.campbluegrass.com for more information. on the CTBA band samplers currently available from the Central Texas Bluegrass Association. And the new Manchaca AllStar Live CD has been released. After 20 years of playing together, we finally decided to take a chance and record ourselves! Order it from us at manchacaallstars@email.com.